The U.S. constitution holds that religion and government must remain independent of one another. However, there’s no getting around it America’s long history of Christian religious tradition. The majority of Americans are Christians, and to many their faith is more than just a part of daily life – it’s absolutely central to their identity. This makes enforcing the separation of church and state somewhat complicated, especially in highly religious areas. Perhaps nowhere is this conflict more apparent than in America’s schools. In theory, religious beliefs are never supposed to enter the realm of public education. In practice, though, this happens all the time. And in the age of social media, perpetrators rarely fly under the radar. 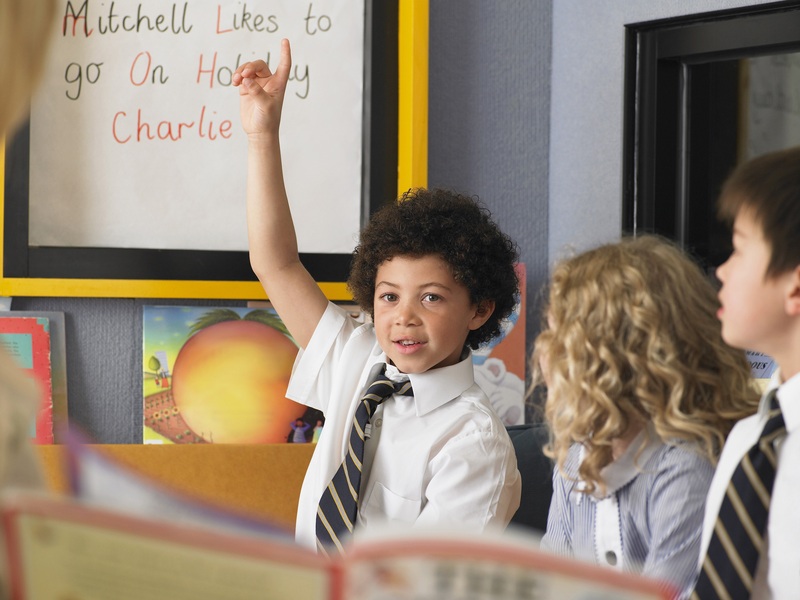 Today we explore the question: has religion invaded our schools? A student participating in a mass baptism on the school football field. To those in the rural Mississippi community, it was a beautiful expression of Christian faith by a respected football coach. However, others saw the baptism in an entirely different light. To them, it was highly inappropriate behavior for a public school employee. If this incident sounds familiar, that’s because it’s happened before. School baptisms are not uncommon in the U.S. In fact, just recently several schools in Georgia came under fire after mass baptisms took place on school property. Many were shocked to learn that church officials actually came to Villa Rica High School to baptize 18 members of the football team, including the coach, on the field before practice. 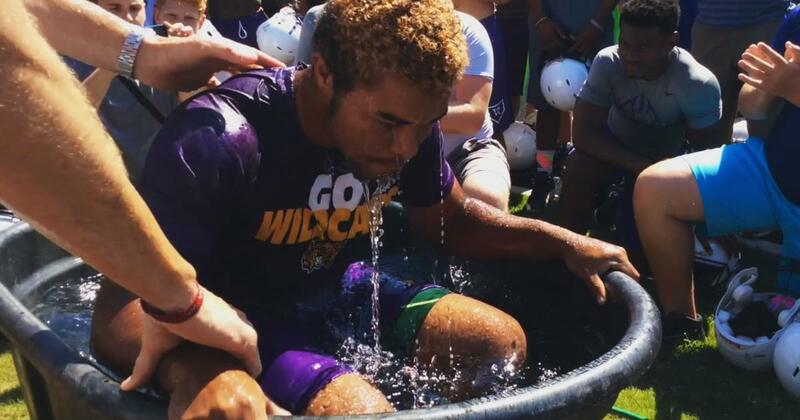 At another high school, the entire football team participated in a mass baptism on school grounds to honor the memory of a former student who had passed away. Both events were filmed and posted on Facebook, but were later removed. “When baptisms and prayer take place directly before a team football practice, on school property, with coaches’ participation, any reasonable student would perceive these activities to be unequivocally endorsed by their school”. Although the most blatant violations may occur on the football field, Christian influence also extends into the classroom. While schools cannot endorse a specific religion, some teachers choose to subtly state their beliefs. For example, they might place a bible on the corner of their desk, or set a small statue of the Virgin Mary on the windowsill. Every so often a legal challenge will direct that these objects be removed, but it’s quite rare. A more obvious example of religious influence can be found in after-school religious clubs – the vast majority of which are Christian. As long as these faith-based groups are student-run, they are permitted to meet in school classrooms. In schools all around the country, students convene after the last bell to hold bible study or prayer sessions. However, not everyone is pleased with the proliferation of Christianity in our nation’s schools. Some groups have decided to take matters into their own hands. Leading the charge, in fact, is none other than the Satanic Temple. All around the country, “After School Satan Clubs” are sprouting up to rival their Christian counterparts. 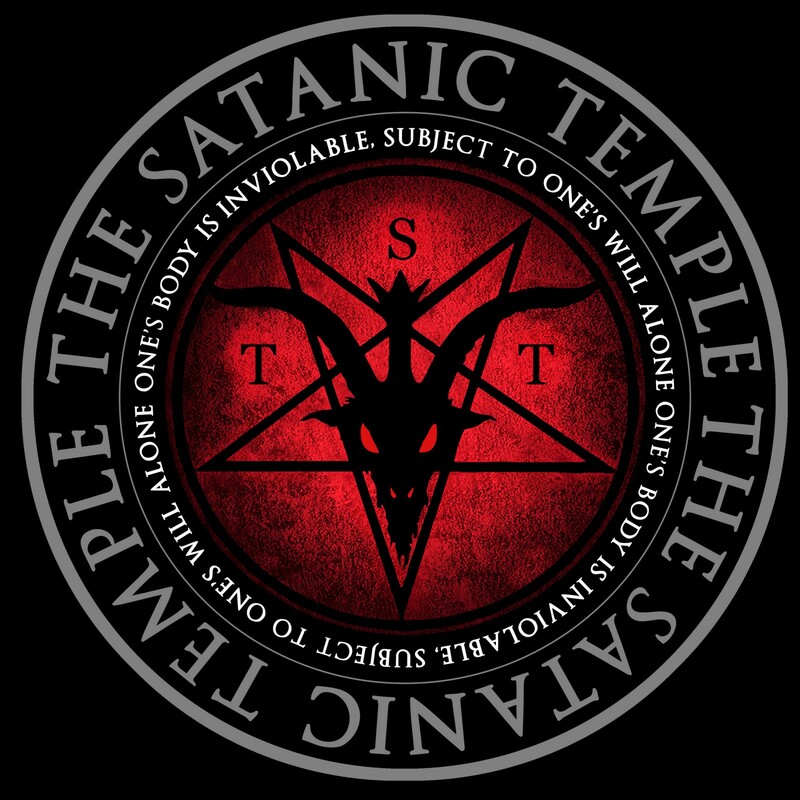 The Satanists are careful to explain that their goal is not to advocate devil-worship – rather, these clubs aim to encourage free thinking and promote religious liberty. However, many parents are not happy about the presence of Satan Clubs – especially those at elementary schools. Some parents are even threatening to pull their kids out of school if the clubs are not banned. One mother expressed her alarm, insisting that the motives behind the Satan Clubs are “not pure”, and that they should be banned because “children are innocent”. Local Satanic Temple leader Lilith Star shot back, explaining that innocent children are exactly what’s at issue. She emphasized the importance of providing children “the tools they need to make their own decisions about the world”, while promoting “science, rationalism, and critical thinking skills”. In her estimation, indoctrinating children with Christian beliefs at a young age is far more dangerous than encouraging them to think for themselves. The Supreme Court made it clear long ago: public schools cannot endorse one religion over another. If a certain faith is represented, others must be permitted a voice as well. Judging by the public reaction, though, the battle over Satan Clubs is far from over. It’s no secret that many Christians in this country feel persecuted. 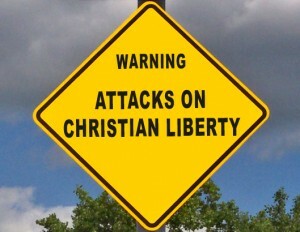 During discussions about religious freedom, a frequently-heard complaint involves the government’s “war on Christianity”. It’s not hard to understand why people feel this way. If belief is deeply ingrained, it’s probably difficult to leave it at the door every time you enter a government building. Devout teachers and football coaches carry their faith with them as they enter the classroom or walk onto the field. Although the law is quite clear, Christians seem unlikely to give in. Football coaches will continue to baptize their players, Virgin Mary statues will stay on the windowsill, and Christian parents will keep fighting against After School Satan Clubs. We’d like to hear your thoughts: Is religion invading our schools, or are these activities just harmless expressions of faith? What, if anything, should be done to address the issue? I believe in the absolute Separation of Church and State! Showing a preference to any faith in a Public School System is just wrong. I don’t want any church or religious organization telling Legislators, Public School or State officials, what to think or do, and likewise I don’t want the State interfering in Religious practices. That only works if both sides respects the rights of the other. So unless it’s a Parochial School, I don’t think it’s appropriate. What do you do about the legislator who uses his/her personal religious beliefs to determine how to vote? If it unacceptable for a legislator to have religious beliefs? Main point: The Constitution, First Amendment, guarantees freedom OF religion, not freedom FROM religion. That is the crux as many try to remove religion totally. We, as a people, cannot remove our beliefs to accommodate others, so why do we demand others do so? Do we turn our backs to the moral codes based in any religion? If we do, I believe we will suffer consequences even worse than we do now. An ethical legislator will consider the common good over his or her personal religious beliefs. If and when they can’t do that on a particular vote, they should recuse themselves from that vote. Case in point, VP candidate Tim Kaine, who is a devout Catholic and does not believe in abortion as a matter of personal belief, yet supports a woman’s right to choose, because his personal belief should not be imposed on others, and women should be free to make their health choices based on their beliefs, not his. If you don’t have freedom FROM religion, you don’t have freedom OF religion. If someone can force or coerce me to practice their religion, or even force me to sit through a religious service not of my faith, I don’t have freedom of religion. It is not necessary to have religion in order to have morals or a “moral code.” Ethical studies utilizing both religious and non-religious people have actually shown no statistically significant difference for the non-religious versus the religious in terms of making ethical/moral decisions that determine behavior. Thank You! As the first President of this Nation, (after the almost decimation of some of my ancestors), has said, this nation is not a christian, muslim, hindu, etc. nation. It was established for people of ALL faiths. If so called christians want to get back to the earliest time of this Nation, they will realize that is exactly what the Liberalists are trying to do. Join US! Since when are the Liberals wanting to get back to how things were in the beginning? That is laughable…. No, you are ” laughable”. Just as President Washington proclaimed this Nation not a christian Nation, Liberals are repeating the same, and in the process of taking back this proclamation as a fact, even today. Going back, and pressing forward! Given how nearly ALL major theistic and non-theistic religions actually teach these same concepts, it would NOT be a theological teaching, but just an issue of simple ethics/morality. Any religion has ZERO business in public life, specially secular life. There are lots of “christian” religions that are just insane. Why do these people think the USA must have a National Religion? Just look at Islam and there is no greater force for evil, death and destruction than religion. Pablo – technically you are taking what radical extremists do and attach it to Islam. A similar comparison would be to claim that the Ku Klux Klan are Christian, so therefore, Christianity is a bunch of racist hate-mongers, which we know in reality is not true. Islam IS a religion, and a fairly good religion. Remember, it IS an Abrahamic faith, worshiping the same deity as Christians and Jews. everyone is entitle to their own opinion , that’s why God gave us free will to decide for ourselves what is right and wrong;however our choices also decides our path. This is why we must choose wisely. I don’t think it’s endorsing or pressuring kids to participate like making them pledge allegiance to the flag every day. Most kids don’t understand what they’re even saying and what it is is like a religion of nationalism. Pledging your life to an entity while declaring it to be one nation under god could be confusing. Separation of church and state is fine as far as being free to express your speech and practice your religion so long as it isn’t negative to others. Satanism tends to lead to blood and black witch magic that is many times linked to criminal activity. I think in high school after completing a quarter or semester class survey of world religions and having a religion fair to explore your chosen religion and why you chose it would be helpful to build tolerance and understanding, but spells and such should stay out of the schools. Dollar bills have satanic symbols with mention of In God We Trust on our currency and the constitution in based on the rights God gave us when we were born. There is only so much separation you can do with that. They should allow it before and after regular activities if the kids want to. I am having a hard time with words right now, to busy LMAO! If students want to ‘explore’ their religions, they should go to church- or their religion’s equivalent. It does not belong in the public schools. Rachel there is so much that concerns me about what you said that I’m not even sure where to start, but I’ll try. First, there is no “religion of nationalism.” Pledging loyalty to our country is not “pledging our life.” I’d love to have “one national under god” removed from the pledge, but after it was inserted during the cold war, it literally would take another act of Congress to get it out, and I don’t think that’s going to happen. Freedom of religion means freedom to practice the religion of your choice. We don’t get to choose which ones are valid. That concept invalidates the whole “freedom” thing. Who chooses? The government? You? Me? Poverty and injustice lead to criminal activity, not religion. I’m not going to try to sort out the mixing of Satanism with Wicca and who knows what else you’re confusing because you didn’t provide enough information to figure out where you’ve actually got it wrong – but suffice for now to say you’ve got it wrong. “Having a religion fair to explore your chosen religion?” In school? First, I don’t even want the survey of religion class – that’s a class to offer in college as an elective for those who want it. The teaching of basic tenets of world religions is useful as a tool for understanding different cultures, but that’s as far as it should go in public school. Second, a “religion fair” to “explore your chosen religion” is frightfully close to insisting that every child HAVE a religion. That’s something that should be taught and decided at home, not in public school. By the way, “spells and such” gets back to Wicca, of which you obviously have no understanding, and again, freedom of religion can’t be allowed to wander into our judging which faiths are valid. If you’d like to state which symbols on the dollar bill you consider “satanic” I’ll be happy to discuss that as well. You begin the article with a common lie taught to those who don’t read the Constitution: “The U.S. constitution holds that religion and government must remain independent of one another.” The Constitution proper only states in Article VI that “no religious Test shall ever be required” to hold office or public trust. The First Amendment states “”Congress shall make no law respecting an establishment of religion, or prohibiting the free exercise thereof.” The “Separation of Church and State,” so often quoted, does not exist. The Bill of Rights did not add any Rights not already prohibited from Federal Government interference because it only granted very limited, explicitly defined, powers to the government. The power to interfere with an individual’s Rights of Religion, Speech, Press, to Defend oneself and others, …, are not granted to the Government. Amendments One through Ten were added because people feared that the Federal Government would become like it is becoming today. The Fourteenth Amendment effectively forced the States to also honor these rights. The Constitution prohibits any laws, (including regulations, etc. resulting from a Law,) from restricting any Citizen’s Right to practice their religion. That includes people who are hold office or a public trust. That even extends to people who are Christian. By the Constitution, no government action may prevent a coach of a public school from baptizing a player unless some sort of government force was used to force that player into it. If there was public school enforced coercion, then obviously, even if hard to prove, the coercion would have violated the player’s Rights. I am Christian. I’ve met very few Christians who believe as I do. I don’t know of any who live in my area. I have lived in areas where Christianity, as most define it, was not the main religion. I’ve been to others where anything called “Christianity” was insignificant. I grew up as a military brat where there were many different religions, often using the same facilities. Even when I served in the Navy, nobody dared to step on anybodies religious freedoms. I chose my children’s home school group because it accepted and had families of several different religions, ethnicities, and economic and social backgrounds. I don’t believe that, by the Constitution, a Christian has any Rights that all others don’t also have. However, they don’t have any less, either. It means that the freedom of or from religion cannot apply to our government. The government cannot have a religious belief or national church. If you represent the government, local, state or federal, you cannot practice your religious on anyone as you do your government business. It doesn’t say that you can’t say a prayer or wear your cross or Star of David. You just can’t perform religious acts as part of your position; i.e. declare that divorced people cannot obtain a marriage license because you don’t believe divorced people can remarry. Just as this act is illegal, it also stands that a coach who baptizes his players on school property is breaking a law. We have been successful as a country because of the freedoms we have in believing as we wish. We just can’t practice it on the public dime. See “McCollum vs. The Board of Education”, and (reafirmed by) many other Supreme Court decisions. To date those rulings stand! How can we have “FREEDOM OF RELIGION” if anyone is allowed to inflict their personal religious beliefs on everyone else in Public; especially in PUBLIC Schools, the Courts or Legislatures, or in any other PUBLIC space? I really don’t understand the concept of forcing your beleifs on anyone else: As if they’d then become “True Believers”. BTW, if you have a problem with that, take it up with the Supreme Court… I didn’t interpret the Constitution, they did. BTW, my comment appears (while being moderated anyway), to be out of intended order. this was a reply to Randy Charles Ford, and not intended as an argument, but merely stated as Fact, as decided by the United States Supreme Court. I know this is an older Post, but wish to reply. I also agree that the Establishment Clause,”Congress shall make no law respecting an establishment of religion”, means that Government cannot establish a religion, nor hold any one religious belief above another; and, the Prohibition Clause, “…or prohibiting the free exercise thereof.”, meaning that Government cannot stop someone from practicing their religion. So, yes, there definitely is a separation of church and State. Now there are people who for some strange high and mighty, my religion is better than your religion reason, not mentioning a name, (starts with chris), insists on reading “free exercise of religion” meaning they can willy-nilly force young children to listen to, participate in, and recite stories and prayers of a religion their parents do not partake of; force to have their holidays lifted up and celebrated by the mass of society, without the privilege for other religions to do the same, (oh!, there is a war against my religion/my beliefs; again, starts with “chris”); who uses government as a robe of authority to have the laws of their belief system to rule over all people, even though most people do not believe, or practice that religion; and who throws a fit worse than a small child when they cannot/are not getting their way. This religion, (starting with “chris”), believes their religion was formally established by government to be the one and only ruling religion of this country. Though there is no proof of such, being that most of the 39 signers along with 16 others who debated/drafted our Declaration of Independence (July 1776), the Articles of Confederation (drafted 1777, ratified 1781) and the Constitution of the United States of America (1789)((from, Religious Affiliation of the Founding Fathers of the United States of America)) were not just of a chritianism belief, but much influenced by Deist belief system, so having non-christianism Deists, and christianism Deists. Also, many were influenced by Unitarian belief system. Then factor in that many if not all were in what at that time was more of a secret society than it is today, Freemasonry, with their influence of ancient Egyptian teachings, yogic and meditation teachings, divination, teachings of a secular, and noble way Man should live, with the only mandatory belief that one believe in a Higher Power/Source, however one sees this, and whatever Name one is drawn to. So, any idea that our U.S., or even the colonies, were established only on christianisms belief system, falls away as a mist of smoke. From what I’ve seen, all the negativity started when the first G.Bush said he wanted to make prayer mandatory in the public schools again, & went as far as to say it would be o.k. to ostracize children who didn’t have that belief because it’d show them it ‘wasn’t normal.’ Then ‘Children need to pray!’ bumper stickers started showing up all over the place. Then others wanted equal time. Now there’s the so-called Good News Club, and public schools making children pray to ‘Allah,’ and it’s one big ol’ mess. And from what I’ve seen, before G.Bush decided to take the law into his own hands, not many people cared or made a big deal of it. Well, except, of course, the ‘chris’ you’re referring to- only the ‘fun…’ chris-‘ who’ve felt it their right to violate the law and make kids recite Bible verses in school and so forth. Nobody’s religion (no pun intended) trumps another’s, and the Supreme Court decision back when I was in kindergarten was right. You got that right. I was going to post the same thing about the first sentence. There is NOTHING in the Constitution that provides a separation of religion and the government. This is a lie, perpetuated by those who choose to remain ignorant of our countries laws. As long as there are tests, there WILL be prayer in school. Clayton Beardmore, that really made me smile… Very cleaver. Yes, I’ve engaged in my fair share of personal prayer throughout my academic career and life, but while also realizing, that part is for my confidence and is a personal and private matter, and together with preperation delivers success. I’d hope the issue here isn’t personal prayer… I mean individual. No one should be offended by that, or could be if it’s an unobtrusive private moment. It’s nonsense that we should all check our beliefs at the door of any institution, just so long as we are not inflicting them on others. I believe that’s what is at issue here… That “Inflicting” part! Sad the Christian Parents (who are so upset over these “Satan Clubs” operating within THEIR schools), cannot see the hypocrisy of expecting to inflict their beliefs on others, while insisting anything to the contrary be quashed. It’s a shared PUBLIC space! There seems to be a total disconnect on the part of too many groups in this regard (Religious, or otherwise) within our society these days. About going into your room (or personal space), and praying in private to your father who is in heaven… Unlike the hypocrites, who do their alms, and prayer, and fasting in public, before men, to be seen by them. As Jesus put it, they’ve gotten their reward. …And of course, if one really needs to pray collectively, or Publicly, there’s always Church! Tough call. However the division between church and state is a key lynchpin in our society. Coach pleasing on-field baptisms seem to be crossing a very well-defined legal division. I was unaware of this phenomenon and find it troubling. I think as long as the practice religion, of any type, overlaps legal boundaries, we will always be searching for the answer through our courts. This country was founded by men who thought that Christianity was abhorrent. This is unacceptable. There are to many different faiths in a public school.to force only one is wrong. If a parent wants their child to pray in school,it’s called catholic school, and that is fine.but not in public. This is coercion, plain and simple. Most kids will go along in order to fit in. The law doesn’t prevent anyone from practicing their individual faith – bring a stack of bibles if you want – but it should prevent forced group activities in public school. EACH PERSON UNTO THEMSELVEs AS EACH PERSON HAS THEIR OWN OPINION BUT BY LAW, N O !!! I do not understand the comments here. You are saying forcing. I don’t believe anyone forced these children into becoming baptized. If I offer to baptize you and you say no, then ok. If the kids are doing it because everyone else is and are afraid they may be ridiculed…your child needs to grow a spine or have parents who instill confidence in them. This is what is wrong with society. Coddling and lack of a voice. If you do not want to practice then don’t. I don’t believe children should be made to pray as a class or study the bible absolutely not, but if someone who has a certain belief offers something then why shouldn’t they be able to participate? Why should their freedom be taken away because “you don’t want to hear it.” If you don’t, then don’t participate. If you feel like an outsider that is your choice. If everyone in my job watches football and I hate sports should I have to join in the football conversation, no. As long as it isn’t a mandatory sentence then let those who want to participate do so. “…have parents who instill confidence in them…” And a child has control over that how exactly? Not every child has parents who instill confidence. Not every school, nor every parent, would support a child who “grew a spine” and defied the wishes of an adult in authority. There is a reason that laws regarding many things are stricter for those who have “custody or control” over a person, and especially a child – because coercion is all too easy. The coach is free to “participate” in his own beliefs, but when he brings the children who are under his control into it, there’s no difference than if the school did it. He represents the school, therefore the school is engaging in the preference of his religious expression over others. You contradict yourself when you say if someone feels like an outsider, that’s their choice, yet you believe they should “grow a spine” and refuse to participate if they don’t want to be baptized. Which is it? Should they submit to the coercion so as not to “choose” to be an outsider, or should they “grow a spine” and refuse, thus “choosing” to be an outsider, subjecting themselves, in many cases, to ridicule, and even bullying? You’ve obviously forgotten what it’s like to be a kid in school – or you were among the fortunate who had parents who both instilled confidence and would support you under these circumstances. Many have neither. Grow a spine to take whatever stance you wish. If you feel you should not participate don’t (which may make you an outsider in some cases) or if you want to do so. This coach did not make it mandatory! He asked who wanted to be baptized and some did if you want to pray together some did. You absolutely do not have to just as you absolutely do not have to practice a certain religion. As a child I was very much aware of that in jr high as our many of our youth. Maybe I give kids too much credit but I believe they are capable of making his simple decision. If they get bullied that is another issue and one that is not unique to this situation as it happens everyday. So because bullying happens every day, it shouldn’t, or won’t be a consideration when kids make a decision that puts them at odds with the group, as well as the adult with authority? Of course they’re capable of making the decision but even adults make decisions that are, at least partially, based on known or perceived consequences. The act of “forcing” someone to do your bidding by threat is the very definition of coercion. The fact that the threat may be implied rather than stated makes it no less so. Oh, we HAVE a voice, but YOU won’t listen! We’ve been telling you to keep your religion out of OUR face, and the face of OUR child! I WAS a child who would not participate in classroom prayer in the 50’s and 60’s, and I can tell you first hand that there were MANY Christian kids who took note and dished out their own brand of ‘schooling’ to me. As an Irishman and an Aries, their lessons was to no avail, but there are all kinds of kids who suffer at the hands of so-called Christians! Gandhi famously said, “I like your Christ. I don’t like your Christians for they are not Christ-like”. Nobody cares when a person keeps their faith to themselves, their home and church. It’s when you want to flaunt it in the faces of everyone around you in public that you get this kind of flack, and rightfully so. In other words… don’t start nothing, there won’t be nothing! This is wonderful, the argument that children are innocent, justifying sparing them the abuse of satanic religion such as Christianity that misrepresents God as a sadistic tyrant who had to restrain himself from torturing all of humanity in eternal hellfire by the murder of his only son so that whosoever believeeth could spend eternity with that sadistic tyrant. It is marvelous to examine objectively the implications of the big lie blasphemy against the common good of everything that is and our own existence through all the generations of the river of life. Wow, Ellis. Try some Metamucil. Obviously blasphemy isn’t helping you. I wish we could be objective and see the obvious blasphemy of Biblical deceptions but when your mind is set, many generational culturally brainwashed with deeply ingrained theistic concepts, being open minded seems impossible. If we can see this as if for the first time without preconceived belief than an enlightenment will happen. Well, yes, the post is in elementary style, but the outrage is heard loud and clear. You, John Owens, need to take Metamucil. I wish I could say “well said”… though I believe the gist of it all is a very good point. You just gave every persons’ desire, to be equal, not to be forced into some one elses’ belief system. That is what is wrong with christianity, God in school, in public areas, every where, as long it is your version of God and Goddess, your belief systems, your religion. So called christians whine about being bullied, being attacked; look in the mirror and you all will find the true tyrant, and terrorists. This is what and how the christian faith was spread, after becoming married with governments. Are you choking on your own words yet? But not everyone believes that! As a Christ-Taoist, I do not believe Jesus came here to start any new Religion, just to reform one, and to try and bring everyone into a common humanity centered in love. I find his message and the Tao (my concept of God, which I believe Jesus emanated from) to be very similar teachings and compatible Symmetry’s . Not selling anything, just saying! But what if I was pushing my faith on others, my “Christ-Taoist” concept of RELIGION? Is it okay if I force that concept on anyone within the public sphere of my authority, or even in a church that believes differently, or on any unwilling partipants? And No, it’s not okay! That’s my belief. I also do not believe a child especially, or even adults should be forced into positions of Religious Peer Pressure. I was against an Atheist continuing in her position as a “Christian Minister” within the UCC (after she lost her belief in Jesus and in any personal god, and then refused to continue in the sacraments of her previously chosen denomination), and for this very same reason… She is now inflicting her Atheist views on a decidedly Christian Organization. I stand with any Religious or even Non-Beleiving Organization’s right to define themselves; unmolested by divergent Individuals, other faiths, outside agitation, or the State or Secular community. Equally so (and a bit in reverse), anyone in a position of authority, within a Public Space, has no right to inflict their personal beliefs on an entire assembly either, especially when any such assembly is most assuredly comprised of mixed beliefs. That’s Separation of Church and State! As I said before, if this was a Parochial School, then no problem, but it’s PUBLIC SCHOOLS they are talking about here. Why not just make “Public Schools” about Reading, Writing, and Arithmetic, and Sports and whatever else is normally taught in a secular setting, and let families and churches teach THEIR Religion. If not, even if you have a concept of God, and are for Jesus as I am, but are also for Pro-Christian teaching in Public Schools and Public spaces, which I am totally opposed to, then who’s Christianity is to be taught? Is it okay to Baptise a Muslim or a Jew or a Catholic or a Presbyterian or an Atheist into some Coaches, or say Math Teachers Fundamentalist Faith, or shove those concepts down their throats, because most say it’s okay? What if there are more Muslims in a particular community? Can they then force-feed Islam to your kid? We are talking about vulnerable Children here, so cave in to peer pressure and go with the flow is more likely than defiance! And what kind of resentment will that breed? Religion cannot and should not, in any way be coercion, or then it is entirely dead, and completely meaningless. My son was baptized with his football team before the start of the season – a proud tradition in our little town. Why should the GOVERMENT be able to tell us CHRISTIANS how to worship God???!! That’s called COMMUNISM…. One thing for sure – we need to MAKE AMERICA GREAT AGAIN. YES! Finally someone with some sense in this conversation. If those kids don’t want to be baptized, no one is forcing them to…only offering the opportunity to accept CHRIST into their lives. If they were Muslims, the liberals would require schools to provide them a place to pray. There is a WAR on CHRISTIANITY in this country and we need to make a stand. That is such crap – the War on Christianity is a figment of Fox News. No one is preventing anyone from practicing their religion. What’s objectionable and inappropriate is doing it in such a manner that there is no reasonable choice but for everyone to participate. If they were Muslims, yes they would need a place to pray. They would not be insisting that everyone else participate in their prayers – so no comparison. I feel the same way about someone offering me the “opportunity to accept Christ” as I do when they offer me the opportunity to eat asparagus. It’s a childhood trauma issue and it won’t be met with a kind reception. It’s up to the family to “offer the opportunity” it they so choose. If they were “offering the opportunity” to accept Allah I’m sure you wouldn’t feel so positive about it. Why should Muslims be afforded a place to pray in our school system and Christians not allowed? That is what is a load of crap. Separation of Church and State is just that! All religion! if we are to interpret the Constitution as you have. We cannot make allowances for Muslims and not anyone else. If this were the case, then why were the couple who refused to bake a wedding cake for gays based on their religious beliefs sued and lost? No, if we all can’t practice our beliefs than none can! That’s a lot of hate there pastorrichard13. Not only are you engaging in logical fallacies to make your point, you are falsely assuming that Muslims are the only persons of faith who would be accommodated if they ask. You have always been free to practice your beliefs, while others have been discriminated against and denied the right to practice theirs. Like so many, you’d like to insist that others are being given special treatment, when what they are being given is really only what you’ve had all along. No HSW, I would insist on equal treatment for everyone. If special prayer rooms are to be set aside for one religion, then they must make room for all religions. I have no issue with Muslims taking their prayer time at work either, off the clock and on scheduled break times. There should be no SPECIAL arrangements made for any religion. There is no hate at all, there is also no political correctness. That is also something that has gotten out of hand. But that’s for another post. Sir, you clearly can’t read, or you choose to only see what you choose to see. I don’t have time for either of those scenarios.. I read and comprehend very well thank you. The fact that you have no more time for discussion proves to me that you are guilty of that which you accuse me. And I am ok with that. God Bless and have a great day! Please educate yourself in the ideas behind the ‘original’ constitution and the true intent of the founding fathers, and in the concept of ‘Communism’. America was great from the minute we free’d ourselves from the religious oppression of England’s Christanity… and it still is to this day. Something Trump supporters will never understand. You, sir, are extremely ignorant. You understand nothing about our Constitution and our form of government. I bet you can’t even name what kind of government we have. It’s a democratic republic; one of the very few on earth. The government isn’t telling you how to worship God. It’s telling you that the worship of ANY god cannot happen in the school, which is a government authority and subject to government laws. If you want to baptize your son, do it in your church, not at school. Believe it or not, your government allows you to believe in whatever god you want, just not on the public nickel. Being baptized is not worship, it is an outward sign of an inward acceptance, spiritually. And you are not going to make me believe there was not at the very least, 2 or 3 young men there that did not feel right about what was going on, but for the sake of not wanting to cause trouble, did not say anything. And, Secondly, was there any parents contacted about christianism practices being performed with there kids, before this happened? Think about it, would you be O.K. with this if it was your kid, and another religion was doing something similar? Case Closed, and won. Sorry for the poor writing, and wrong spelling; thinking and typing not in sync. Ha, Ha, Ha! Yes, let’s go back to the “beginning” to when the U.S. was for ALL Religions, or none. And, “America” great again? Which part, Brazil, Canada, Mexico, Peru, etc.? America is a Continent, not a Country. If that were the case than the whole of the Continent would be ruled under one ruler. Actually “America” is 2 Continents not 1, North America and South America, made up of many independent countries with only 2 occupying North America, with both being predominately Christian. South America is also predominately Christian ( Catholic) if I am not mistaken. 2.) The dominant and correct word you used is “pre-dominately”; not the only religion, therefore my premise is still correct. You’re saying GOVERNMENT should not be able to tell you CHRISTIANS how to Worship because that’s COMMUNISM; and even in Public Schools and within Public Spaces? If so, then based on your own views, the GOVERNMENT doesn’t have a right to tell anyone how to worship; even in a Public School or Public Space! Or does your view of “FREEDOM OF RELIGION only extend to CHRISTIANS, but not to any other “Faiths”, especially to any concepts of “God” you disagree with, or that aren’t CHRISTIAN, and especially to those very disagreeable “Satan Clubs”? Is that also what you’re saying? “By the way, FREEDOM OF RELIGION is only for CHRISTIANS”! Is that what your really saying?! If so, which CHRISTIANS?… Are Catholics, Presbyterians, Seventh Day Adventists, Christ-Taoists, Baptists, Holy-Rollers, UCC, Church of Christ, Lutherans, Christian-Orthodox, Unity, Scientology and so many other avowd “Christian” denominations included… Or just the one’s you approve of; such as your own? Just your brand of CHRISTIANS? If so, is that really “Christian”; is it even “American”; or is it the very reason we have FREEDOM OF RELIGION in the first place, but also why we also have Separation of Church and State? So that no ONE Religion becomes dominant, or (God Forbid) a “STATE RELIGION”. Because when that happens, “RELIGION” then gets legislated by the very GOVERNMENT you do not want meddling in your CHRISTIAN faith! So be careful what you pray for! We have a Separation of Church and State; exactly, so that the GOVERNMENT you disagree with, isn’t in the business of preferring or legislating anyone’s RELIGION! But also so that no ONE “Faith” or group or individual can impose their beliefs on so many others, who happen to believe differently. Now I don’t know about you, (betting it’ll be YOUR Religion the GOVERNMENT picks, that wins), but I wouldn’t want to live under ANY of those regimes! The solution is school choice since religion in school is what some people want but what others don’t want. Saying those who want religion in school should pay to send their children to private schools is not fair since they would still have to pay taxes to support public schools. We should stop fighting and let people choose the schooling they want for their children. So you’re saying we should segregate our public schools by religion? That is what homeschooling is for! This country is in real trouble. People need to wake up. Shillary is unfit to be president she is a thief and charloton. she helped ISIS carry out 9/11 and now she wants to oppress the blacks. This is all because we took Jesus out of our schools and kids are made to convert to Islam in the name of political correctness. HA, HA, HA, HA! There just are no words for this one, Mary. I really for sorry for those who will not think for themselves. So…then Senator Clinton helped ISIS in 2001…when they didn’t exist…how exactly? And how exactly does she want to “oppress the blacks”? And where exactly are kids being made to convert to Islam? Back in the basket please. When a person in a position of authority or influence over a child says that they follow a certain philosophy and the child’s peers generally follow the same philosophy, the child feels influenced or pressured to follow along. It may be neither good or bad, it simply “is”. We can either eliminate all religious expression, or allow all religious expression. Can we eliminate the pressure to follow whatever path is most prevalent in the area? I’m not sure. White christian pilgrims come to america. Quickly kill or incarcerate the native americans. Make it illegal for them to speak their native language, practice their cultural heritage, and practice their religion. We have never made amends. Then we kidnap africans, destroy their families, enslave them, beat them, kill them. We make it illegal for them to speak their native language, practice their cultural heritage, and practice their religion. We have never made amends. Then we go west, we import chinese labor to build our railroads. We beat them for being chinese, starve them in the land of the free and the home of the brave. We have never made amends. During all these times what was the dominant religion of the USA? Christianity. There is no war on christians or christianity in america. But there is a call from deep inside all human beings for justice, compassion, and respect. If you don’t want every religion to be practicing its faith in our schools, then lets keep our public schools secular. Practice our faiths in our places or worship and in our hearts. But most of all, lets practice the principles of our religions in all of our relationships, and demonstrate to others the best that our religions have to offer. Each religion has something beautiful and loving, let’s share it with each other. Knowing you may not be inclined to allow me; I really liked what you wrote and am wandering if you would allow me post your words to Facebook? Just asking. A Truthful and Honest Assessment… That unfortunately, too many would rather ignore, forget, or pretend never happened. Moving forward, we must be accountable for our actions, or we will continue to suffer the consequences: All moral teachings hold to this just principle. We must also begin to approach each other from a stated desire of Inclusion, or the future will look very much like the past. We The People… Can either make this Nation what it has stated it stands for, and finally fulfill our potential, and for everyone (even in the face of so much hypocritical pretending), or then we are all destined for failure. I still believe in the “American Dream” (though it’s countenance is now so very downcast), but we still have a chance to get it right and to make it right, but only if we all come together, respectfully, and truly as “One Nation (under God), indivisible, with Liberty and Justice for All”! As a non-Christian minister, the extent to which Christian doctrines, beliefs, and traditions are allowed to dominate our schools, my doctrines, beliefs, and traditions are suppressed by the state. My ancestors came to this continent to escape that same kind of suppression by the Anglican church, which acted under authority of the crown. Only by freedom from religion can we enjoy freedom of religion. Besides, if it is not enough to live by one’s faith, then one’s faith is lacking. Forcing others to participate in it cannot make it stronger. Sadly all to many of the I want my way and only my way entitled types Fail to understand that publicly owned and paid for with everyone’s taxes are not for religious purposes . Your freedom ends where mine begin I should not have to listen to your preaching any more than you are required to participate in mine . 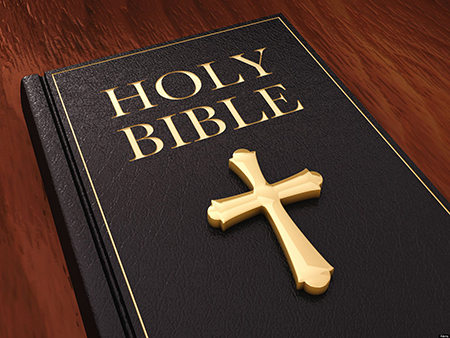 Your religious beliefs belong in your home and or church you can pray loud and proud in either place you pay for them its like religious schools wanting to get tax money the only thing the government should provide is the same text books provided to public schools . Any thing beyond that is your issue to buy . As for an authority figure enforcing praters and baptism’s its no different then them have a sexual relationship both can be harmful and a child may feel powerless to say no . And would become a so called discipline problem if they tried to walk away Back in the 60’s I was issued detentions and corporal punishment for refusing to bow my head and recite the morning prayer after it was officially outlawed for and adult to lead them . If you insit on your rights then you must give them to me as well Most of the things you are trying to claim are what the nation was founded upon were things that Truman and the congress did in the early 50’s as a answer to the communist godless red’s . Jefferson wrote there was a separation of state and church Adams also was clear in his writings that they should not be mixed If you read the debates over the constitution they actually considered banning a few of the more radically minded churches including the fairly new baptist sect’s . You need to remember A large number of settlers left Europe to be free from state sponsored churches be it catholic or Anglican ” Church of England ” . back at that time they wrote the constitution in very simple easy to understand language its taken well over 200 years of legal nit picking an hair spiting to get to this stage of well it means I have the right to use public resources to force my religion onto you . They felt you were responsible for your actions if they annoyed another . The constitution has a built in safeguard on laws forcing your opinions on others its called the courts congress can pass any law they like but the courts are charged with ensuring that do not infringe on the rights of anyone else . This truth is so hard for others to see; religion gets in the way. The kid is on his own time and is making a personal choice, so who cares? Fine, “The kid is on his own time…”, but not on my dime !! I believe religion should be somewhat encouraged in schools but not in the details and not excessively. I due believe and highly encourage religion as a subject and the exploration of different religions (the ancient dead ones and the ones we’re familiar with). Religion is a choice and children should not feel alienated or embarrassed to be different. Well, it seems this tired argument has popped up once again. And once again I hear 2 sides of the wrong coin. Allow my to add another dimension. First, I need to know who among you are mind readers? You see, in order to take either side of your coin, someone has to be the thought police. No? No one? Ok, we will come back to this. A belief, or faith if you prefer is something that is contained inside of you. We could be the same religion, and yet believe in that religion very different from one another. Religion needs to be kept in your own heart, and in your own home. Parents are responsible for teaching their children right from wrong and not the schools. The schools need to keep to the subjects they were created to teach in the first place. So, religious clubs need to be kept in your own home, not at school. In my heart, I keep my faith/belief a certain way. Since you are not a mind reader, you do not know how I believe. I will raise my children according to my beliefs and with in the laws society has enacted. I do not need the schools doing my job for me. In today’s world, parents have handed more and more of THEIR responsibility to the government. Children are not a convenience, they are OUR future and it is up to the parents to teach the lessons of life. What is so frustrating about reading all topics like this one is that personal beliefs were NEVER suppose to be the subject of arguments. This is not open for debate. You either take care of your children, or you don’t. Something occurred to me regarding this subject- not long ago, I was studying about the history of the Southern Baptist Convention, and learned that after the ‘takeover’ by fundamentalists in 1979 the religion ceased to resemble the original ‘traditional’ Southern Baptist, including but not limited to this subject: the traditional Southern Baptist religion believed in the separation of church and state. So, curious, I was checking other mainstream Christian denominations, and while I didn’t have the time to check into every single one, I found it interesting that one after another shared the same belief- Methodist, Catholic, Presbyterian, etc. all believe in the separation of church and state. So with that in mind, who exactly are the christians who are pushing to put religion back into public schools, when these mainstream Christian denominations do not believe in it? I agree with absolutely everything you said here – and “who exactly” they are is a really good question. I first learned about this when I read a book titled “The Good News Club” by Katherine Stewart. Every parent, grandparent, teacher, and other concerned persons should read it as soon as possible. I hope it’s o.k. to mention the book and link (not connected to each other)- I don’t know the author or site owner, but feel the more people who know about this ‘club’ the better. They are taking away parents’ rights, schools’ rights, and even using taxpayers’ money to set up ‘churches’ in public school buildings. I haven’t looked into it lately, but I believe this is a private club, with voluntary membership. If so, it’s completely legal, and I’m not really having a problem with it. It’s when religious instruction moves into the classroom, with only an “opt out” that singles out kids who don’t want to participate, that I have an issue. This country was founded on faith.take it out of our everyday life and u.s .falls.amen. Tom is correct about the founding of our country, and the founders’ intentions. A lot of us do just well without religion – “faith” is another matter. I have “faith” in the ultimate good of humanity. I have “faith” that most people will do the right thing simply because it’s the right thing. I have “faith” that most people care about the welfare of others, about our environment, about human rights, and in our country, about the freedoms we hold so dear, one of which is to be left alone to practice our religion, or practice none. We are not “failing.” We are thriving – in spite of the current polarized religious climate, brought about in great part by those who believe we should be governed by their religion (even though they can’t agree on what their religion is. All religion should be kept out of school teaching. That’s what church and at home teachings are for. Children may have their religion, be proud of it, tell other students if asked, etc, etc. Personally, I’m a satanist, and if I had Christian teachings forced down my throat when I was a child, I can guarantee I would despise Christians today. But I witnessed with my own eyes a teacher beating a Muslim child purely because she wore a hijab to school. Which I should mention, many other religions besides Muslim wear, even certain areas of Christianity. Not to mention all the violence towards LGBT+ students that used to take place in this school until we banned the Christian classes and had those teachers sent to jail. I can tell you right now, after we got rid of those classes and the religious pressures in the school, I personally see much less bullying, and am hearing about it far less from my students. your state’s SCHOOL VOUCHER coupon. Each child gets a Voucher. if Home Schooling – it goes to you to buy supplies books computers etc. return Freedom to We The People. Our Kids get a say. The $90,000 / year union teachers that can never be fired – well… the monopoly is over.